If you've been a fan of the Bizarre Foods franchise over on The Travel Channel, brace yourselves. The seventh season of the series is coming up and premiering on Monday, February 11th! And from the looks of things, you're going to need to be a bit brave for some upcoming episodes! MR. ZIMMERN GOES TO WASHINGTON! CHEVY CHASE, MD (December 19, 2012) – He's Back!! Andrew Zimmern, the two-time James Beard Award-winning TV personality, chef, food writer and culinary explorer, continues his quest across the United States exploring the bizarre foods and cultures in his own backyard. The new season of "Bizarre Foods America" with Andrew Zimmern premieres Monday, February 11 at 9:00 p.m. ET/PT. 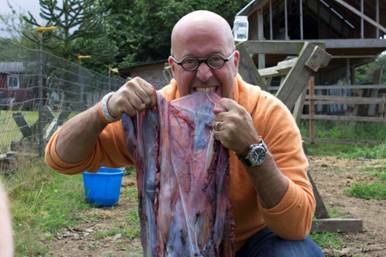 This time, Zimmern's adventures include sampling baked muskrat in Baltimore, deep-fried piglet testicles in Iowa and fermented fish eggs in Alaska. "Bizarre Foods America – Fan Favorites," a one-hour special featuring highlights from past episodes taped in the U.S. and voted on by fans, premieres on Monday, February 11 at 8:00 p.m. ET/PT. The announcement of the seventh season in the "Bizarre Foods" franchise was made today by Andy Singer, General Manager, Travel Channel. The premiere episode of "Bizarre Foods America" takes viewers to Washington, D.C. where Zimmern uncovers a surprising food scene in our nation's capital. Skipping the textbook history lesson and sightseeing tours, he heads along the banks of the Potomac River to bow hunt snakehead fish – known for a thick coating of mucous and razor sharp teeth. This infamous endangered species unexpectedly ends up on menus of upscale D.C restaurants served on a brioche bun with pickled onions and chipotle slaw. While back in the city, Zimmern explores some of the unusual food truck offerings that provide a mobile oasis for hungry Federal workers – from a spicy pig sandwich (peanut butter with red jalapeno jelly, prosciutto, bacon and apple slices), the Spam Masube (slice of Spam surrounded by sushi rice, wrapped in nori) and beef tongue Mexican tacos. In other parts of Washington, he experiences kosher soul food and Salvadoran favorites and discovers that the District of Columbia is a melting pot of flavors – both old and new. "The bizarre foods that we continue to find all across America keep getting profoundly stranger with every season, but more importantly the stories of the people and the understanding we gain by peeking into their cultures is explosively more resonant this season," said Zimmern. "From the Rockies to the Ozarks to the Chesapeake Bay, the hidden worlds we uncovered have some food traditions that even shocked me!" Throughout the new season, Zimmern crisscrosses the country stopping in locations including Alaska's Inside Passage, Baltimore and the Chesapeake, Chicago, Denver and Wisconsin helping viewers relate to the traditional foods passed down by immigrants to modern dishes born and bred by American innovation. Along the way, he discovers the quirky subcultures and prevailing traditions of the United States. Inc. for Travel Channel. For Tremendous!, the executive producers are Andrew Zimmern and Colleen Needles Steward. For Travel Channel, the executive producer is David E. Gerber.